Create stable cell lines that produce exosomes with a specific miRNA cargo—great for manufacturing engineered exosomes. There are 26 individual products in this category. 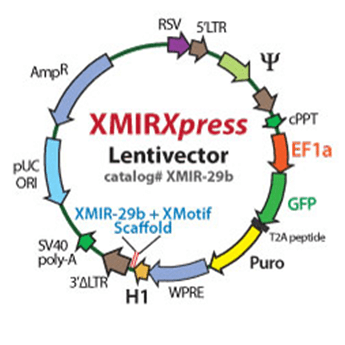 Expanding on our powerful XMIR and AXMIR technologies, SBI developed the XMIRXpress Lentivector System, which enables the creation of stable cell lines that produce exosomes carrying a specific miRNA. Just as with XMIR and AXMIR, you can take advantage of normal cellular processes to package a specific miRNA into exosomes, and then use those exosomes to deliver that miRNA to target cells. Choose from one of our pre-built, ready-to-transfect XMIRXpress Lentivectors (see list below). If you don’t see the miRNA you’re interested in, simply contact us at tech@systembio.com and we’ll design and synthesize the custom XMIR for you, or build your own using the XMIRXpress Cloning Lentivector.